The museum’s modern gallery showcases classic Ferrari racecars which highlight Ferrari’s penchant for masterful design and technology. The cars are rotated every six months. 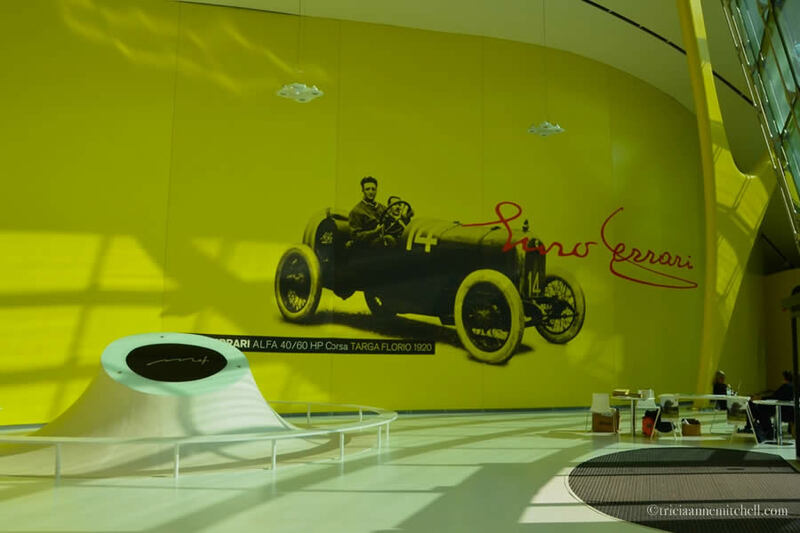 A multimedia presentation projected on the showroom’s walls tells the Ferrari story, while upholding Modena’s automotive legacy. Supercar manufacturers Maserati, Pagani and De Tomaso also have roots in Modena. 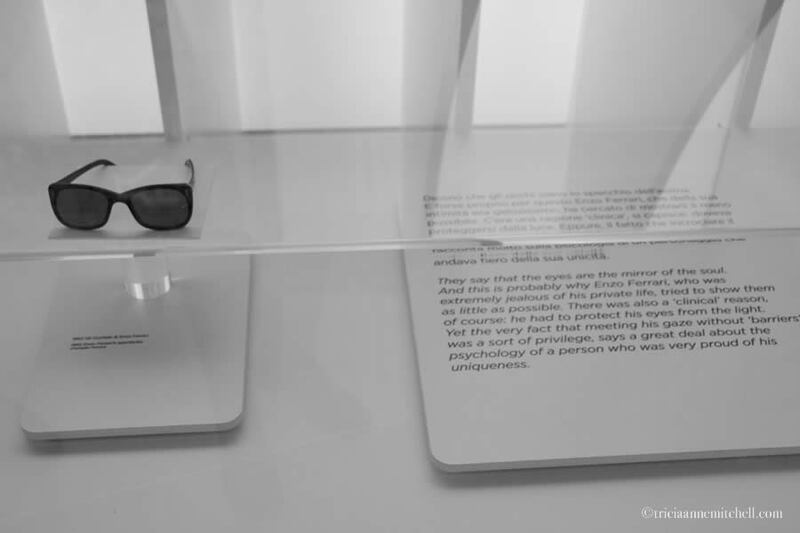 Adjacent to the gallery is Ferrari’s childhood home, which houses life artifacts ranging from photographs and trophies to film snippets, even Ferrari’s birth certificate and his trademark dark sunglasses. 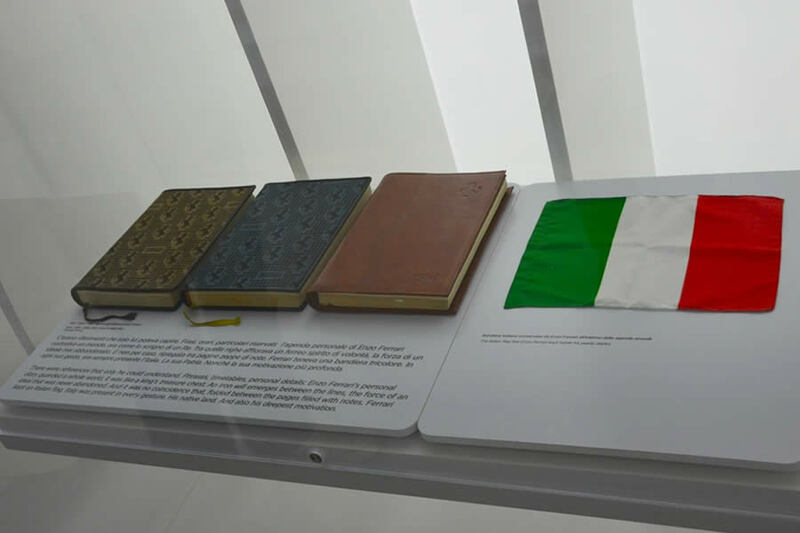 Another display explains the inspiration behind Ferrari’s prancing horse logo, as well as the symbol’s various incarnations. The city of Modena’s signature color is yellow. So it’s no surprise that the color graces the interior walls of the museum’s showroom, as well as the futuristic building’s exterior. The building features geothermal technology. 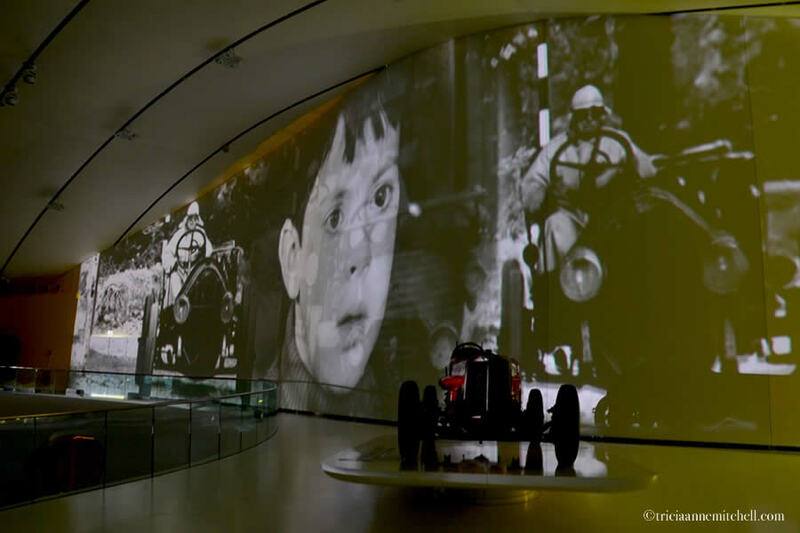 A multimedia presentation tells the Ferrari story of the 20th and 21st centuries. 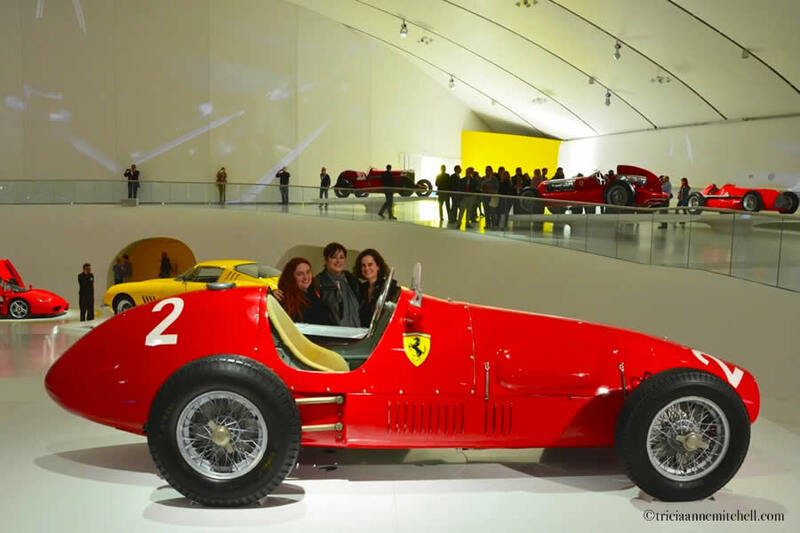 Elena, Francesca and I admire a brilliant-red roadster. 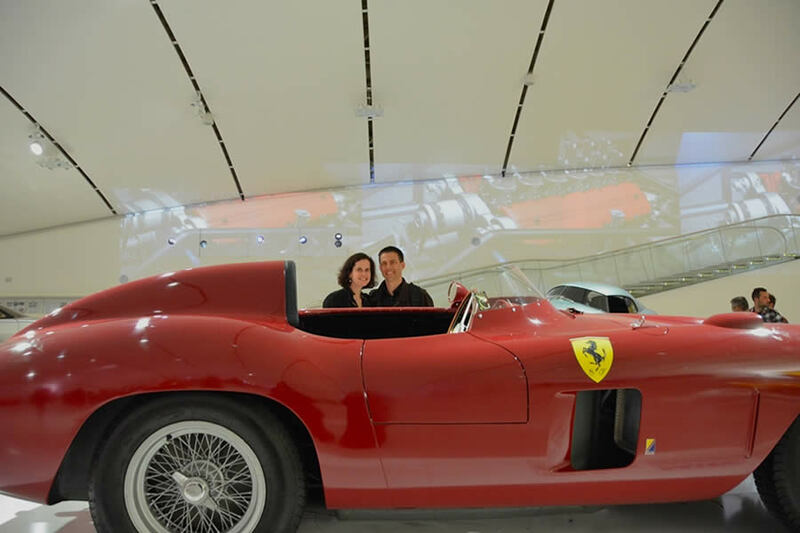 This Italian pair was well-versed on their Italian automotive knowledge! 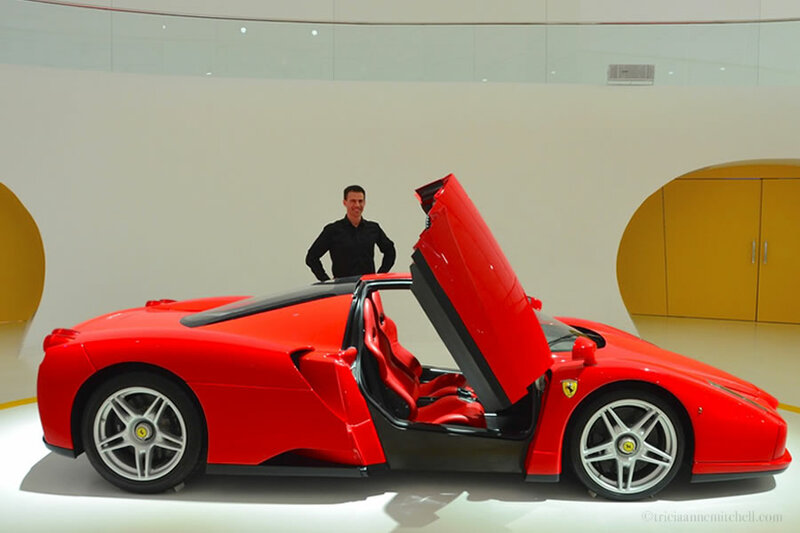 Adjacent to the state-of-the-art showroom is Ferrari’s former home – where he was born in 1898. 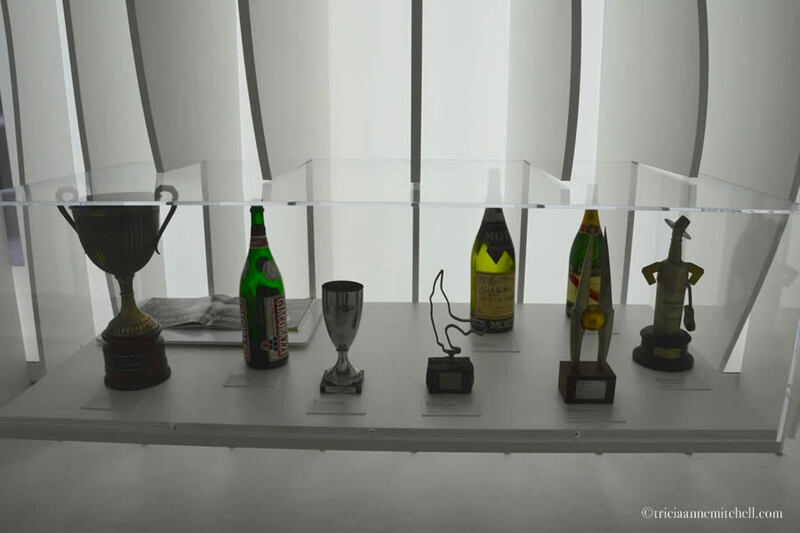 Inside, there is racing memorabilia, as well as some of Ferrari’s personal effects. Ferrari’s signature shades. 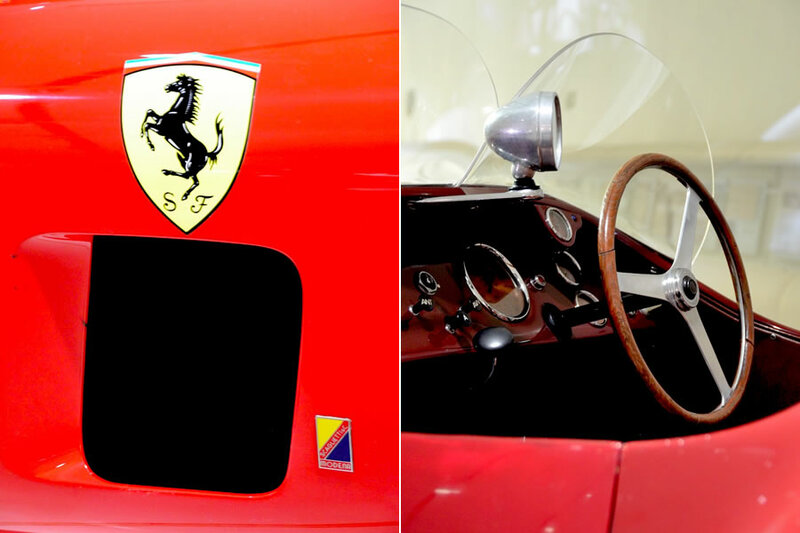 The placard inside speaks to Ferrari’s penchant for privacy. 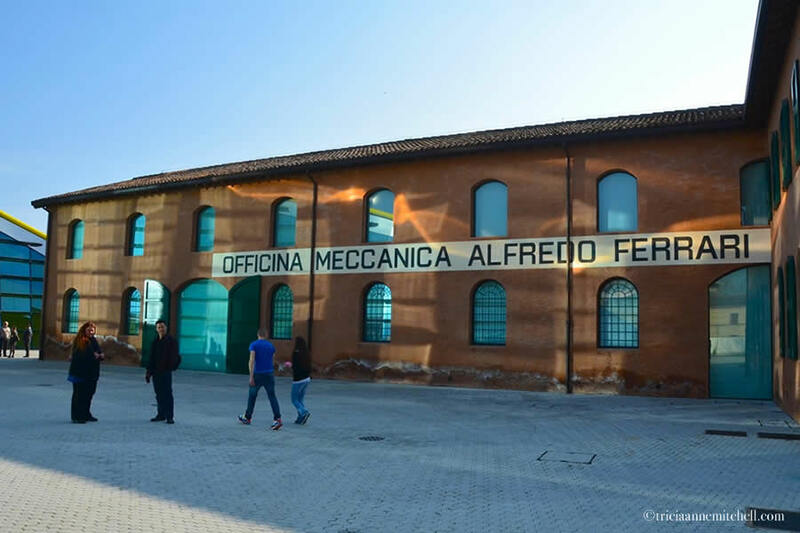 The Museo Casa Enzo Ferrari is located at Via Paolo Ferrari 85, in Modena. While in Modena, we spent 3 nights at the elegant, historic, and centrally-located Hotel Canalgrande. One of our favorite memories from Modena, in fact, was sitting out on our hotel room balcony just before sunset, looking out over Modena’s rooftops, while enjoying goodies that we’d procured at the Albinelli Market earlier in the day. Peruse the Emilia-Romagna Tourist Board and Modena websites for more details about Modena’s and the region’s rich offerings. The tourist board just recently released a free e-book that chronicles Emilia-Romagna’s Art Cities. I wish it’d been published when we were in the region, yet it’s since presented even more excuses to return to this stunning part of Italy. The Emilia-Romagna Tourist Board hosted us during our time in Modena. We’d like to extend an extra special thank you – or grazie mille – to Nick and Francesca for coordinating all the details and making us feel so welcome in Emilia-Romagna. For this excursion, we also thank our guide, Elena, for giving us much insight into local culture. Now I feel like getting in a racing car and opening it up on the highway. That’s how you and Shawn must have felt. Those cars look like fun to drive. Gerard, like you, Shawn and I both had visions of taking one of these classic roadsters out onto the winding, back roads of Northern Italy. Lynne, and I wonder how many beauties are in storage at any given time, since the exhibition is rotated every few months? Wish you and Ron a wonderful weekend, Easter, and return to spring! Mfryan, it seems as though we’ve tiptoed along some of the same paths. Perhaps ours will intersect at some point! Very nice, something I like more than wine. Mark, it sounds like Modena is a must for a car aficionado like yourself then. :) You might recall from one of my earlier posts that the Parmigiano-Reggiano cheese producer that we visited in Modena even had a classic automobile collection on site. I found myself simply smitten by the architecture, history, food and wine of Modena alone, but was pleasantly surprised by this jaunt as well. My husband would enjoy this museum very much. We’ve been to a few automotive museums and I tend to go through rather quickly and wait in the coffee shop with a nice drink and my book while he reads every word on every exhibit!